No wedding would be complete without the flowers. Whether your vision is to walk down the aisle clutching a classic hand-tied bouquet or you prefer an extravagant cascade, your choice of flowers will help set the tone for your big day. The use of wedding flowers can be traced back to ancient Greece, where brides often wore a flower crown, which represented a gift from nature. Some cultures also believe that flowers symbolize fertility in the wedding ceremony. The traditions and usage of wedding flowers continues today, with many variations in different parts of the world and even throughout the United States. Whether you want conservative arrangements of locally-grown flowers on your wedding tables or insist on an abundance of exotic flowers flown in from distant locations, you’ll need to find a florist who can understand your dream and can turn it into reality without exceeding your budget. This can often be challenging, but an experienced florist can help you decide where to skimp and where to splurge to achieve the best results in the most reasonable way. When you start your search for a florist, you may want to begin by getting refers from friends and family members. You can also ask the manager of your wedding location for recommendations. This second option can be particularly helpful since it means that the florist will be familiar with the setup and size of your reception area and will be sure to design your centerpieces to work most appropriately with the scale of the room. In addition, consider doing searches online or looking for links to florists in the many wedding resources you can find on the Internet. You can use this method to browse florists’ websites to see samples of their work. Some websites to try include Martha Stewart, The Knot, and Weddings.com. You can also visit the Bridal Association of America and the National Florist Directory. Finally, you can attend bridal shows or expos in your area, where vendors will display samples of their work and you can have informal conversations with them. Before you commit to any florist, you’ll want to have an introductory meeting. Come prepared with lots of questions, preferences and ideas and also know your budget up front, so you and the florist will be on the same page. This is especially important, since flowers can span a wide range and even if you love the flower designer’s style, if you can’t afford his quality, you’ll end up either over budget or disappointed. You’ll also need to know your wedding date, to ensure that the florist is available for your timeframe. Some brides bring pictures of bouquets and centerpieces they like from wedding magazines to illustrate to the florist exactly what they hope to achieve. It can also helpful to know your color scheme, as well as your ceremony and reception sites and configuration. If you’ve selected your wedding gown and bridesmaid dresses, you can bring photos of these and color swatches for the florist to match as well. When you order wedding flowers, there are a number of different components you and your florist will need to consider. 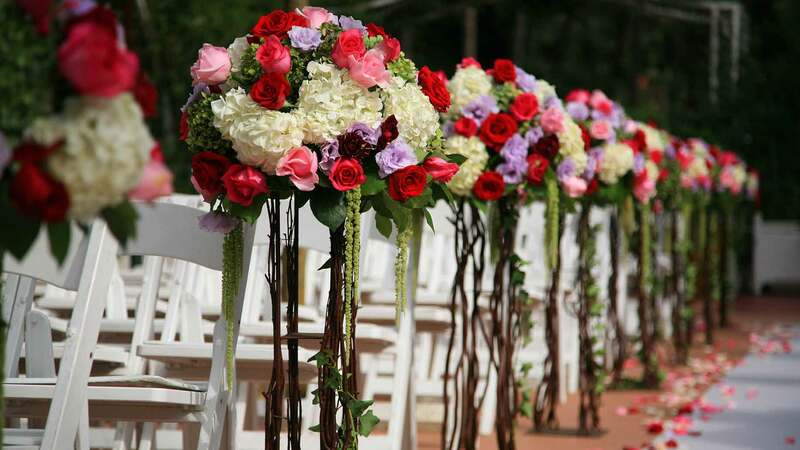 This includes flowers for the wedding party, such as bridal and bridesmaid bouquets, boutonnières for the groom and groomsmen, a flower girl basket, flowers for the mothers and fathers and any flowers for the bridal alter, aisle, pews or other areas at the ceremony location that you want to decorate. Then you’ll also need flowers for the reception, which may include centerpieces for the main tables, serving trays and serving tables, the cake area, the cocktail room, the bar and even the bathroom. If you wonder what it is that affects the bottom line when it comes to the cost of bouquets and floral arrangements, there are several factors that make a difference. First, the size of each grouping matters. The bigger a bouquet or centerpiece is, the more flowers it will include and the more work involved in putting it together. The type of flower you select will also affect the price. Common flowers, such as carnations and daisies, are usually very affordable while more exotic flowers like calla lilies and tulips can be on the pricey side. If there’s one area you want to splurge on, such as having very generously sized centerpieces, you may be able to balance out the cost by paring down some of the other greenery you include at the reception site. With the help of a very experienced and creative florist and lots of flexibility on your part, you should be able to find the perfect. The amount you’ll pay for your wedding flowers can span a huge range. Some of the factors that can affect the price include the size of your arrangement, flower types used, intricacy of the design, time of year and even your geographic location. Keep in mind that most weddings are in the $15,000 to $30,000 range today, so you can figure that wedding flowers typically run between $1,500 and $3,000. Some florists will also charge a fee to deliver and set up your flowers. This can be up to several hundred dollars more, depending on how much time is involved. Limit the number of attendants in your wedding so you won’t need as many bouquets. Select flowers that are in-season, since these will be the most reasonable. Ask your florist to suggest flowers that will be easy to work with, therefore keeping the work involved, and related costs, down. If you want to splurge on very expensive bouquets, select simple floral centerpieces or even go without, opting for candles instead. Keep in mind that the time of year you are getting married can also affect how much you’ll need to spend on flowers. For instance, in the summer, if you get married outside in a garden, you can keep decorations to a minimum since you’ll be able to rely on the scenery. On the other hand, if you plan to get married on Valentine’s Day, you can expect your flower prices to be higher because of the demand around this holiday. Many florists will make a few sample centerpieces and bouquets for you before your big day so you can see the final effect and make any tweaks that you want in advance. This means you’ll need to pay for extra items but the price can be well worth it so you’ll be sure to get exactly what you want on your wedding day.